So Rob Betten and I had the opportunity to attend Parafest 2008. 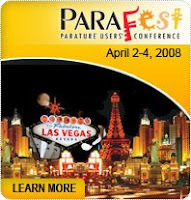 Parafest 2008 was a Conference put together by a company called Parature which provides On Demand Ticketing, Knowledge Management, and Survey applications. We were invited by Michael Buckingham White based out of Atlanta, and the trip was excellent to say the least. The event was filled with excellent breakout sessions on Customer Service & Support Best Practices, Self Service, Embracing Web 2.0, and implementing several online strategies to make your support organization more productive and self service orients. In the attached summary, I will highlight some of the key findings that were discussed throughout the Conference for managing support online. Online Ticketing - Customers Submitting Tickets and Getting Status over the Web. Forum Support - A community forum where customers speak to each other online, ask questions to Product Managment, and ask questions to help solve product related issues prior to escalating or calling support. Chat Support Channels - Several companies offered chat as an alternative solution to their high end customers and found it to be a valuable tool. Voice To Text Ticket Submission - There were several vendors and technologies that employed a system that enabled a call center to allow its customers to check status and create tickets when calling a Support 800 Number. The technology utilizes Interactive Voice Response with Voice transcription technology prior to speaking to any agent. It enables the customer to call an 800 number for support and create a ticket by recording their issue at the ACD level, and support can later follow up with an inquiry to the customer.